Have you tried store bought hot wing sauce and never found it hot enough? 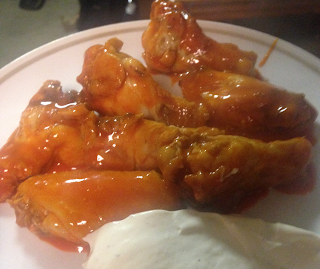 Want a quick and dirty recipe hack for Pizza Hut's super hot Burnin' Hot Buffalo Wings? Sure you do! It's really simple too. Grab a bottle of Frank's Wing Sauce in Hot flavor for your base. You could also substitute another brand in a pinch, but this just nails the recipe to the freaking wall. You'll also need some Tabasco sauce (original) and some sweetener. Pizza Hut uses corn syrup but you can pretty much use what you have on hand. I used some liquid sweetener (the kind you put in your coffee) where 1/2 teaspoon equals about 4 teaspoons of sugar (perfect for my diabetic self). Is it good? Oh yeah. It's the kind of heat that doesn't hit you till the second wing then tingles your lips then opens the sinuses like a cracked dam. I might look like a white girl from the outside but I can take some serious heat. These are the perfect balance of flavors. 1 cup of Frank's brand wing sauce, hot. 1 teaspoon of Tabasco sauce. *Note: Pizza Hut uses corn-syrup. I don't really have measurements on this as I just sprinkle it on lightly. Then I just toss some vegetable oil over the wing and pop them in the oven. Even though I didn't watch the Superbowl, I still rather enjoyed the wings. How is my version is different? Well, I don't bread my wings. Feel free to do so. Pizza Hut does and you pay heavily in calories and carb-count. My way is way healthier and low-carb (go Ketards!). However, the methodology of recreating the sauce will be the same no matter how you like your wings cooked.